Australia’s representative of the holarctic (i.e. pertaining to the entire northern region of the globe) Barn Swallow, it is similar but broader beaked to the Swallows found in Indonesia and Melanesia. Widely spread throughout Australia, except for the Northern Territory and northern & middle Western Australia, they are found as far south as southern Tasmania and as far north as Torres Strait. They are self introduced into New Zealand and are also found on Lord Howe and Norfolk Islands. A tiny bird weighing only 10 grams when fully grown their upper body is a metallic blue-black colour, the forehead and throat russet (reddish-brown) and their belly and under parts whitish. They have a deeply forked v-shaped tail. Living in gregarious flocks of up to 100 birds at night except when nesting, they are mostly found in open areas, man made clearings or urban environments, preferring these to densely forested or aria inland areas, as they provide foraging and feeding space. They are partially migratory after breeding season - which is through spring & summer. 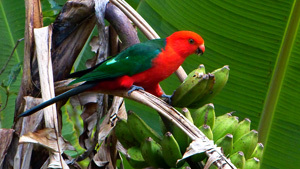 They are very flighty birds and do everything except mate and sleep on the wing including catching all food & feeding. They are amazingly acrobatic and graceful flyers swooping, circling, banking and skimming along still waters to catch their prey of small flying insects, mosquitoes, moths, flies and midgets. Another bird good for the garden and around the outside of your house! They eat approx. 400 times a day! (that’s every 2 minutes) and need to eat their own body weight daily to maintain their health and energy. They are very hard to keep in care/captivity as not only do the stress severely in any confinement but they must have such a large amount of live and frequent intake of protein rich food to stay alive. We have to feed them every 10-15 mins from sun up to sun down! The male and female build a small cup like mud nests spending days making it from scooping up and transporting the mud in their mouths from nearby waterways and thickly lining the nest with grass, animal hair and feathers to soften for their chicks. These little mud nests are built vertically on cliff walls, hollow trees, under bridges & culverts, caves & mine shafts and with urbanization often in open sheds, barns, under eaves in shops & houses. This is often where they get in to trouble as people often don’t like them nesting, chirping & flying around for food all day and doing their droppings there. They lay 4 – 6 eggs and from hatching of the eggs to fledgling/flying it is only 2-3 weeks so we try and encourage people who are inconvenienced with them being there to live with & enjoy their beauty and then take the nest down after the chicks have left and blocking access to them building another one in the same spot as they will often use the same nest and can breed 2 or more times per season. They only use the nests during breeding season when they have chicks to raise. They are wonderful hard working parents and will adopt an orphan chick and raise it as their own. WIRES recieve a lot of calls around spring and summer when Swallows are nest as they often built their nest in places not wanted by humans. We ask people to try and live with this as they are only there for 2-3 weeks and then when the chicks have gone they can take down the nest and put up some thing to deter them from nesting there again. I have been involved in a number of cases concerning Swallows – the outcome more often than not depends on the human’s attitude towards the birds. 1) A surf shop in Byron Byron Bay called WIRES re Swallows nesting in their surf board making room. They had to leave the door always open to let out the fumes from the chemicals but the birds were flying in and out putting droppings on the newly rosined boards! The chicks were almost ready to go so we waited the few days and then when parents and chicks had flown out of the building we put up a nice bamboo & beaded curtain. This allowed the fresh air to flow freely in and easy access for the surf builders but the birds couldn’t fly in. They built their next nest outside and raised their next lot of chicks much to the enjoyment of the surfers! 2) A clothing shop in the main street of Byron Bay had a nest built right on top of their doorway and people and their door step were getting lots of droppings on them! I went down and saw that the chicks were starting to fledge and told them that it would only be a matter of a few days to a week and they would be gone. So the shop owners and staff took it as good luck if anyone got pooped on and a few days later the birds had all gone. They put up a piece of wood above the door so that another nest could not be built. Everyone was happy – birds and humans! The man concerned was charged by the National Parks and Wildlife Service and taken to court. He was fined $9,000.00 (that’s $100 per bird) and his name was on the news, radio and papers. I believe he is very remorseful! This was the largest Swallow rescue in the southern hemisphere!! ***If he had called WIRES we could have told him a few very easy solutions to his problem and saved all these beautiful innocent birds and saved him a whole lot of money!! See the images of this incident.